Messaging apps are the new in-thing for developers. These apps offer everything from stickers or emoticons to free voice/ video calls. It is the fastest growing category in the Android & iOS app market at present as more & more people are switching to new messaging apps. Thus, the team that developed Cooliris (an app to store & view all social feeds' images in one place) has come up with BeamIt but in an already crowded market, will this new visual messaging app be able to make its mark? To find out, I got an early access to this app. It is free and adds context to photo sharing on iOS with Web & Android versions. Instead of text, it revolves around photos. The app has an interesting concept & design but I still have a few reservations about it. Continue reading the article to know more. Adding context to photo sharing- BeamIt adds context to photo sharing on iOS with Web & Android versions. If you are in any messaging group, you already know how confusing it can get when comments to photos are linked as separate events. Thus, BeamIt links all conversations & comments to photos making it all feel like one thread. A Cooliris spokesperson explained it as, " Cooliris solves the problem of having photos scattered all over the place and getting them organized in one app — think of it as your photo universe packed in one app". Let me explain how context is provided. If someone in a group of 5 people, shares 5 photos, then generally immediately the other four people start commenting about the photos and it gets hard to decipher who is talking about which particular photo. So, BeamIt allows you to select one photo and comment on it or you can also on all at once. 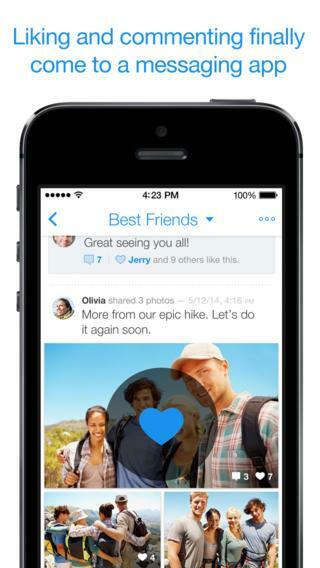 Just long-press any photo from the batch to comment, share, like or save it to the camera roll. Photo Drawers feature- Another good thing is that the app handles multiple photos in a very fine way. This feature is patented by Cooliris. It is like a gallery that allows users to share hundreds of photos at a time, without taking up vertical space in a conversation flow. This means that you don't need to compose the same message again & again. While other messaging apps limit the number, with BeamIt you can send any number of photos at once, in one go. Also, when someone in the group posts multiple photos, you just need to scroll horizontally to look at the various pictures being talked about and scroll down to read conversations around these photos. It is so simple and convenient. Let me illustrate how. I selected 40 images on my iPhone and they started to appear under the message box in a side-scrolling row. If you want to remove any of the pictures before sending the entire batch, you can take a look at the selected pictures by scrolling sideways. After you have sent the pictures, these would appear in 2 rows in an iPhone and in 3 columns in iPad where BeamIt actually shines. One column would list the conversation threads, the second would show the text and the third would show images. Isn't the way this app links text to photos impressive? Unsend feature- There is also an "unsend" feature. If the user deletes an image or message from a conversation, it automatically gets removed from all recipients' phones. This feature is not much explained in the app and so many users might not know this. Full resolution images- Another differentiating factor is that it sends photos in full resolution without compromising the speed. Automatic backup – All the data gets automatically stored in the cloud. So, you don't need to worry about data loss even if your phone gets lost. Offline mode- When you are offline, even then you can express yourself. Prepare the message and it will be posted once you are online. 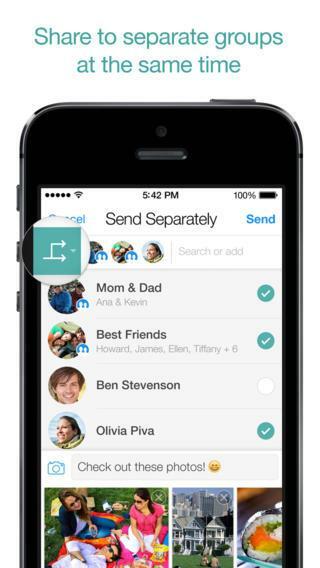 Share via email address – Unlike in other messaging apps, you can share pictures with anyone not having the app. There is an option to email the messages. Other features- This messaging app lets you comment, like & share images with private groups but its design is very different from that of other apps. Unlike other messaging apps, there are no photo editing options and thus, if you want to touch-up a few photos before sending them to your friends, you will have to use another app. Not even a basic auto-enhance option is provided. The Cooliris team should have considered the fact that absence of photo filters is a big competitive loss in today's market. As there are no photo editing options in BeamIt, I edited my pictures in iOS Photos app and when I tried to select these pictures via BeamIt, they disappeared. I had to restart the app for the pictures to show up again. I selected 30 images from library and to clear them before sending across, I had to do this manually which was very tiresome. To like or comment on a photo, one has to long press it which is quite frustrating. However, the good thing is that Cooliris will be launching an updated version in the first week of July. 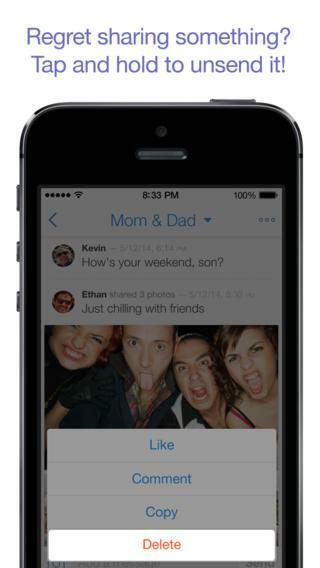 In the new version, there will be buttons at the bottom of photos to make it easier to comment on or like a picture. The app is free but there are some paid features also which are not yet revealed by the Cooliris team. The good thing is that it is ad-free. It was released on June 26 and is available for iPad & iPhone with web & Android versions coming soon. While the web versions of BeamIt are expected to land in the next 4-5 weeks, the Android version is expected to come before October. I am quite happy to find this app due to its new features & convenience. The way the comments can be easily made as well as viewed (without scrolling up & down to figure out what is happening) is a great relief to my thumbs.